Nomac Drilling’s pink ribbon drill rig. If you thought pink KFC buckets of fried chicken was as bad as pinkwashing could get, we’ve got news for you. Turns out Nomac Drilling, the second largest natural gas producer in the U.S., is in the running for worst pinkwasher yet. 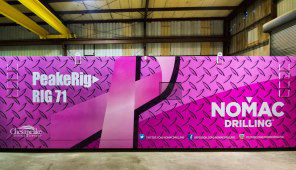 Recently the company unveiled their drilling rig wrapped in a big bold pink ribboned package in support of breast cancer awareness! Nomac Drilling, and its parent company, Chesapeake Energy, claim to care about women living with and at risk of breast cancer by promoting their pink rig, while they continue to pump cancer-linked chemicals into our environment. You know what this is: PINKWASHING! Hydraulic fracturing, better known as fracking, is a process used to get at oil and gas deposits trapped deep within the earth. In this process drilling rigs bore horizontally through bedrock, blast it with explosives, and force into the earth millions of gallons of water laced with a mix of poisonous chemicals. Many of these chemicals raise health concerns, and some are linked to an increased risk of cancers, including breast cancer. The rapidly growing fracking industry raises major public health concerns, especially as fracking continues in communities across the country without any regulation. Fracking involves mixing a variety of chemicals with water and blasting the resulting chemical soup underground in order to extract natural gas or oil for energy. Once the chemical and water solution is underground, it can potentially leach into groundwater and impact nearby communities or faraway city-dwellers next time they reach for the tap. We are extremely concerned about fracking’s impact on public health, and so is a growing movement of individuals and organizations across the country. We need a precautionary, prevention-oriented approach to reducing environmental cancer risk. 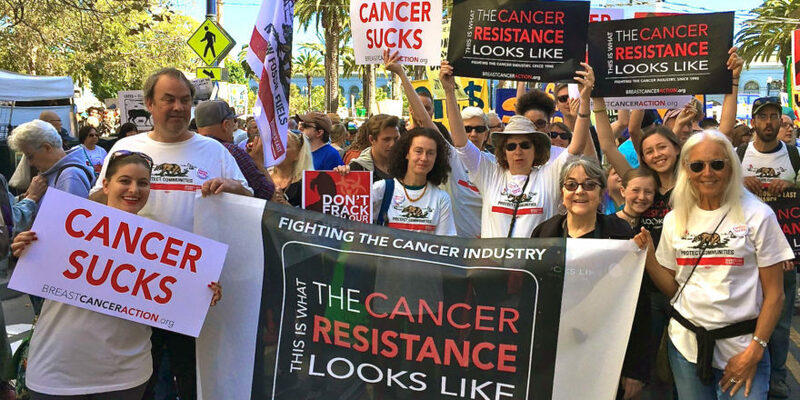 Natural gas and oil extraction is a toxic industry that, if left unchallenged, stands in the way of a meaningful approach to cancer prevention. If Nomac Drilling and Chesapeake Energy (who recently made a $10,000 donation to a Susan G. Komen affiliate) truly care about breast cancer, they should first stop exposing women to chemicals that may increase the risk the disease and commit to stop exposing women across the county to these harmful chemicals. True concern means you don’t contribute to the possibility of more women actually getting breast cancer! A pink wrapped drilling rig and monetary donations don’t cancel out the first step of making sure you are doing no harm! Join BCAction and our friends at the Environmental Working Group and urge Chesapeake Energy’s CEO Aubrey McClendon to commit his company and all of its subsidiaries to stop using chemicals that are linked to cancer, including increased risk of breast cancer and to sign BCAction’s Pledge to Prevent Pinkwashing. Even though October is over, the pinkwashing continues. It’s time we say enough! Take action today. For more information about fracking, check out Environmental Working Group’s webpage. ← Thank you for taking action with us. Now go VOTE!